Delivery of your Treats - We Delivery to your Doorstep ! 1. In the event of a non-delivery occurs on account of a mistake by you (i.e. mobile number or any other wrong information) any extra cost incurred by sweets.lk for redelivery shall be claimed from you. 2. You shall use the services provided by sweets.lk, its affiliates, consultants and contracted companies, for lawful purposes only and comply with all applicable laws and regulations while using the service /transacting on the application. 3. You should provide authentic and true information in all instances where such information is requested of you. 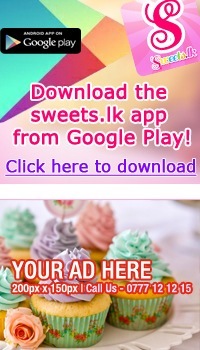 Sweets.lk reserves the right to confirm and validate the information and other details provided by you at any point of time. If upon confirmation your details are found not to be true (wholly or partly), sweets.lk has the right in its sole discretion to reject the registration and debar you from using the Services without prior intimation whatsoever. 5. The address and contact information to which delivery of the good is ordered by you is to be made will be correct and proper in all respects. 6. Before placing an order please check the product description carefully. By placing an order for a product you agree to be bound by the conditions of sale included in the item's description. 7. Carefully read the description of the product and the retail brand’s location before placing the order. 8. On some festive occasions, owing to the number of product orders, the product might be delivered before or after the selected date and time by you. We do not take any responsibility for such late or early deliveries. 9. We are a service which acts as a facilitator for users, who want to send goods, and retail brands who own them. We do not take any responsibility for any losses, expenses, quality of products or services, damages and / or taxes / incurred by Users / Merchants in the use of our facility. The price you pay includes the Merchant cost inclusive of all taxes and our service charge. 10. For orders in which problem arises owing to the mistake of the user e.g. wrong mobile number or incomplete information or recipient not reachable, no refund will be given. Redelivery charges, if any, will be borne by the user. 11. We will not be responsible for any delay / non-delivery of the order by the Merchant because of flood, fire, wars, act of God or for any reason that are beyond our control. For such orders a complete refund will be provided.